My Banana Swirl Parfait did a decent job at holding me over for about 3 hours….Then, I was STARVING! I knew that would happen since I forgot my fruit. Lucky for me I had a drawer stocked full of their healthy recommended snacks. 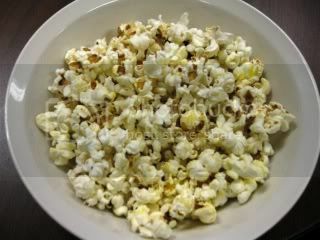 I grabbed a 100 cal mini bag of popcorn ~ it was sooo good. Why have I waited so long to eat popcorn?! Body Sculpt was so incredibly intense today at lunch that I just know I am going to be sore tomorrow for sure. I think she was seriously working us so we would have “Buns of Steel”! 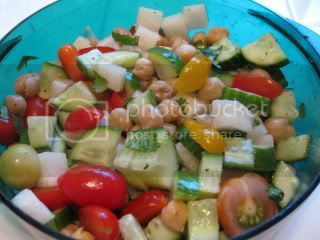 I came back for lunch and I was really looking for to the “Citrus ChickPea Salad”. It is 4 WWP for the ENTIRE dish. ** For future reference I would ADD 1 Tbsp balsamic vinegar to boost the flavor. I whipped it up last night after the Mexican Fiesta and let it marinate overnight. All in all the flavor was not bad and I think if I had added the balsamic it would have been perfect! It was light and refreshing and would be good on a hot summer day. 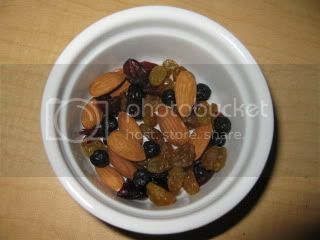 I managed to hold out until 3:30 for my afternoon snack ~ 10 raw almonds and 1 Heaping Tbsp TJ’s Berry Blend. Tonight is going to be another busy one. Since I somehow managed to leave my CELL PHONE at the GYM ~ ugh! I have to track back after work to get it. Drop my co-worker off, head to the nephews baseball game, stop by the grocery store (forgot shrimp! ), cook dinner plus dessert (I can’t wait – it sounds so good!) and journal. I did take the gym up on their free fruit selection and grabbed an apple for later since I may need it. Phew! See you all late tonight! Yum to the chickpeas! I haven’t had them in a while and now I want them!! Good luck with your busy evening! Free Fruit at the gym?! Sweet Action! I made something similar to your waffle sandwiches, except I put yogurt, cherries, and blackberries on top and then a sprinkle of cinnamon! OMG puuuure heaven. I want to eat it all over again! That salad looks awesome! I bet the flavors were really great together. That's a good idea to let it marinate overnight! I love that your gym offers free fruit! that salad looks/sounds SO good but i know it would hurt my geographic tongue.. sigh, cry. 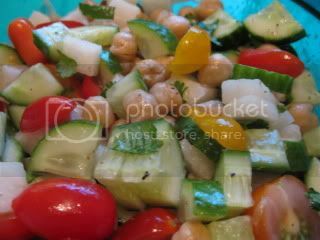 K ~ I LOVE chickpeas and use them often as a meat substitute. You should check out the chick pea tacos (look up surprise tacos in the search)- they rock! Nutritios ~ LOL @ your BFF but after that snack, I totally get why. Anne ~ I loved the salad because it only took like 5 minutes to make it and then I just grabbed it and left. C.G. ~ Me too – if they ever take the fruit away I'd be lost. Janetha ~ you just have to tell your tongue to get out of the way so you can enjoy some good eats.